Are you thinking of buying a condo in Thailand? Most apartments for sale in Thailand are located in so called Condominiums. These are apartment complexes with facilities such as security, communal pool and gym. In many of these condominiums there are several hundred apartments – anyway in most cases the pool is rarely crowded and you can relax. Many owners use the apartments only on weekends or during the holidays. Presale or resale? Which condo for sale in Thailand is the right one? One of the first things you have to ask yourself is if you want to buy a presale or a resale condo in Thailand. Which is the right condo for sale in Thailand for yourself? What does presale mean? Most major developers start selling during or even before construction. There are show rooms that can be viewed by clients so you know how your condo gonna look like. The prices during the presale period are lower and you can choose the unit you like the most. Often the prices are more than 20% lower then when the condominium is completed. In addition, usually you only pay a 15% down payment and the balance is paid on completion and transfer – hence the financial risk is limited. This is a common practice in Asia and most developer have finished several condominiums. Buying a condo on the beach or inland? The next question is of course where should the apartment be? A direct beach location or a bit out of the hustle and bustle? Of course this is a question of price and location. Even inland the distances to the beach isn’t exceeding 2.5 km. A majority of our customers decide on an apartment for the simple reason that most everything is within walking distance and no car is needed. Additional costs when purchasing real estate in Thailand! The costs for purchasing real estate in Thailand are composed of various points and are thus dependent on several factors. On the one hand we recommend all our clients to consult an independent lawyer that handles the transaction. The prices for the consultation, preparation of the sales contracts, due diligence and so on are between 40000 – 70000 Baht. It depends on the registered value of the property and if it is a new building or a resale. If the property is less than 5 years in the possession of the seller there is an additional 3% Specific Business Tax to pay. Thus, one can expect about 4 -7% of the registered value of the property (not the purchase price) in taxes and fees. In 95% of all transactions all costs are shared between buyer and seller equally (unless otherwise agreed). The additional costs of purchasing property in Thailand are therefore within manageable limits. We can find out quickly which costs you have to expect so that there is no surprise after signing the contract. Which maintenance costs do you have to expect? Again, the involved cost vary from condominium to condominium and is therefore dependent on the facilities offered. Some of the condominiums have only communal pool and security while others have a gym, library or reading room and other shared facilities. The size of the pool also plays a decisive role. In most of the condominiums the monthly costs are between 20 and 60 baht per square meter of living area. Water is a precious commodity today, but not expensive in Thailand. 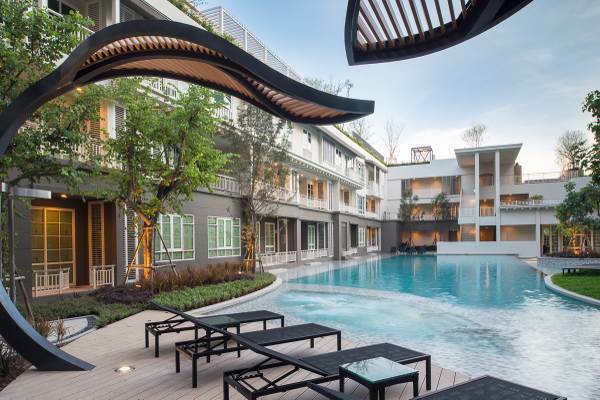 The two biggest cost factors – a private pool and a large garden – are not part of a condo and the average cost for water is between 100 – 300 baht per month. Electricity varies really on each individual person. Especially air conditioners can consume quite a bit of electricity. From experience one can say 1000 to 3000 baht a month should be the norm depending on the usage of aircons. Can I own and register a condo in Thailand in my own name? Another important point is that you can own an apartment in Thailand officially in your name (more in our article “Thai Law Property Ownership“). When buying a house in Thailand you can have the house registered in your name but only lease the land. Even though Leasehold is absolutely safe, provided that the contracts are properly and lawfully prepared some customers do not like the idea of “renting” the land for 90 years. In this case a condo purchase may be the better option. Here you can browse the latest apartments and condos for sale in Hua Hin Thailand. If you have further questions or like to schedule an appointment don’t hesitate to contact us anytime.